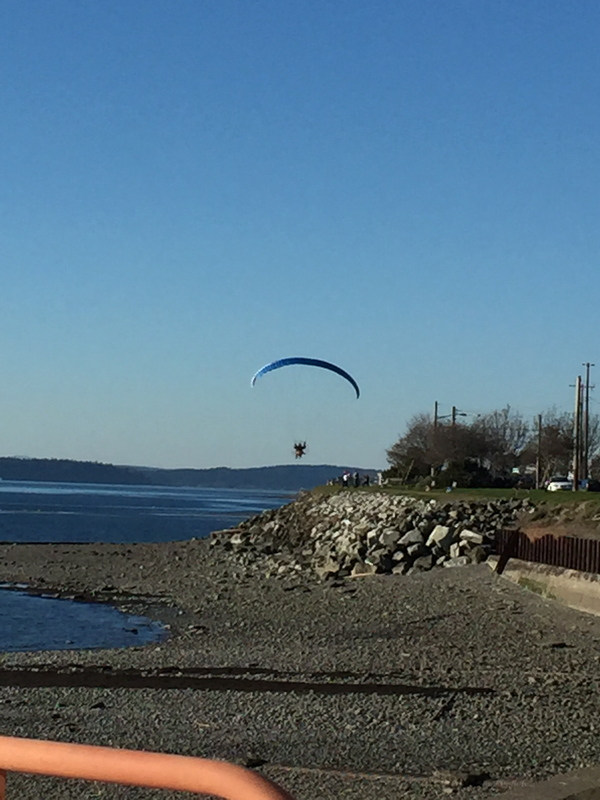 Yesterday, yet another sea lion has drifted upon the shores around West Seattle. This one conveniently floated around the rip-rap sea wall right into the Don Armeni Boat Ramp. Although this sea lion wasn’t immediately pronounced “shot” by the person performing the necropsy, odds are pretty good according to recent history. Robin Lindsey of Seal Sitters informed me that it would be a couple of days following X-rays to determine cause of death. Seal Sitters tape off latest victim. The following video was taken yesterday afternoon , December 4th as a crew of folks worked to turn the large mammal over for examination. I can tell you now that it’s good practice to stay upwind! It was brought to our attention that the “Bart Simpson” house on Alki Point has been listed for sale. The home has a fresh coat of exterior paint which covered up the fun painting of Bart doing some graffiti on the home. If you look real close, you can barely see where Bart entertained passers by for years. Hopefully the new owners of this Alki home will be fans of The Simpsons so that Bart can return! We were driving along Alki this afternoon when we were surprised to see that the beautiful blue glass tree has been knocked down. We have no idea why or how this happened…just saddened to see it in this state. Hopefully it can be repaired and upright soon for all to enjoy. Almost 6:00 and only a few slurps over the bulkhead.Looks like we dodged a bullet as far as flooding is concerned on Beach Drive SW. Now it’s time to kick back & enjoy the show with a hot toddy. We have very strong northerly winds this afternoon along with higher tides. King Tides officially started this afternoon and continue through the 27th for November. 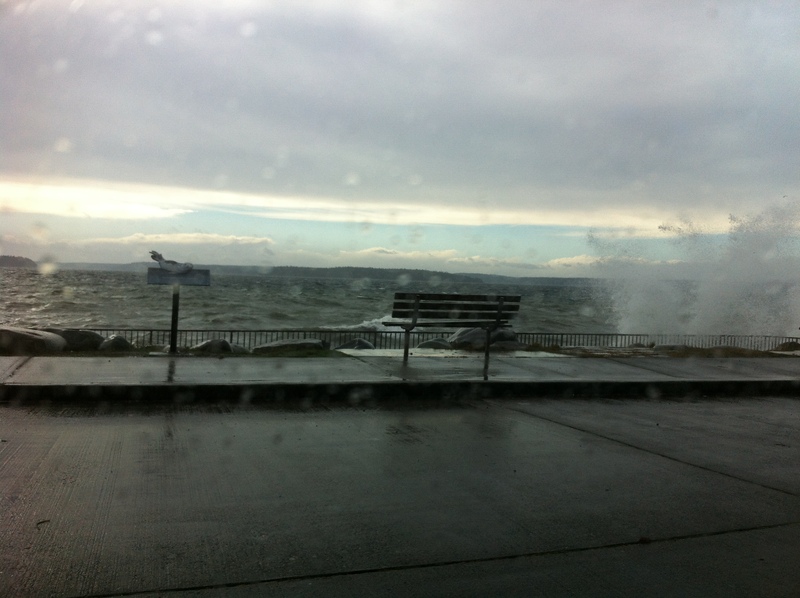 Late this afternoon, the King County Ferry opted not to dock at Alki after two attempts. Video credits to Scupper. Passengers were waiting on the Alki dock hoping they’ll get a refund for not being able to board. 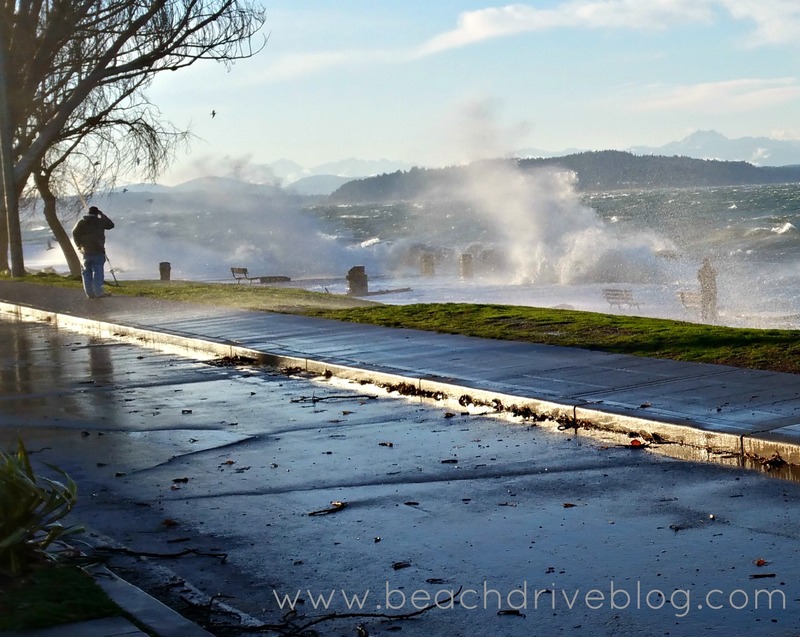 Thanks to Michele, a friend of Beach Drive Blog for sending us these pics! 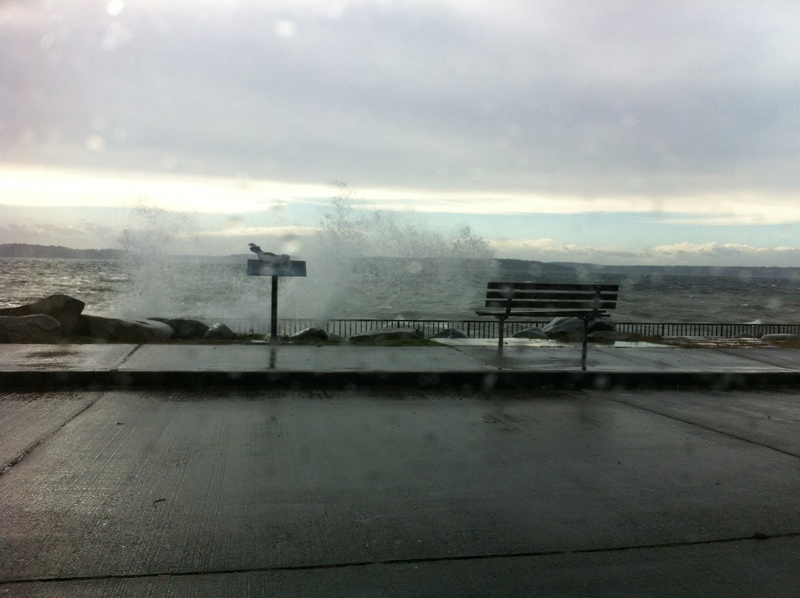 And this photo of the seas crashing up to what is typically a sandy beach with a park, picnic tables and fire pits. Quite spectacular! 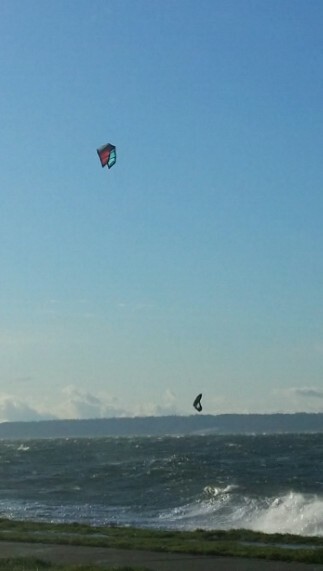 Here’s some videos I captured of this afternoon along Alki. Please pardon my shaky hands. This north of the volley ball pits with the kite surfer. 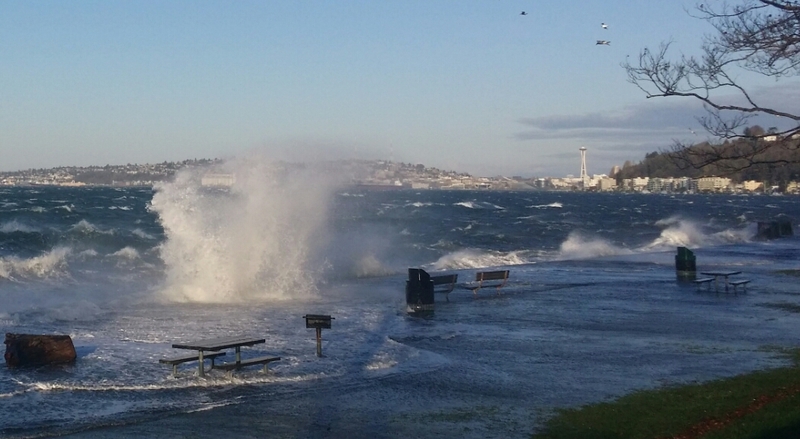 This is by 61st and Alki. This is at the end of the park as it heads towards Alki point, looking back towards Seattle. This person braved the waves (see the person in the mist to the right). 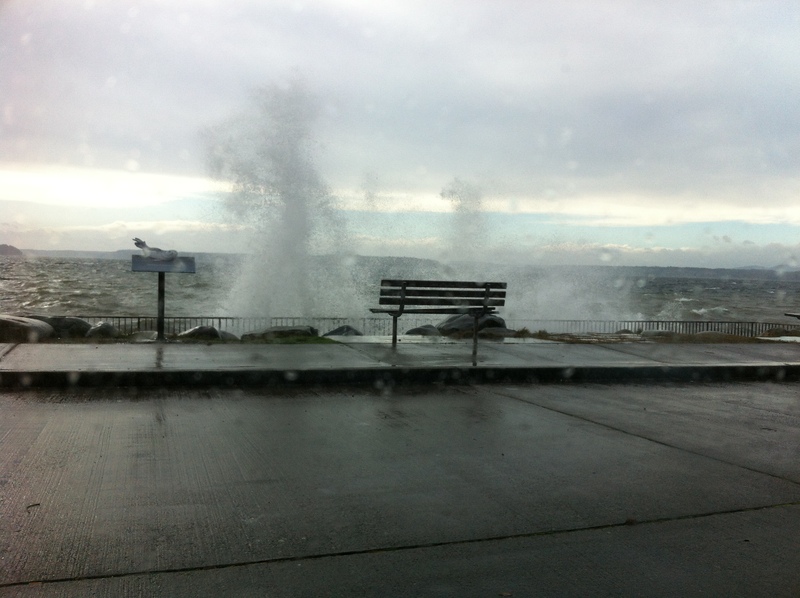 I’m so glad that I was able to witness this event and hope the home owners along Alki weathered this okay and are safe. New stink to an old story? EDITORS NOTE: Please scroll to the bottom of this post for an update. 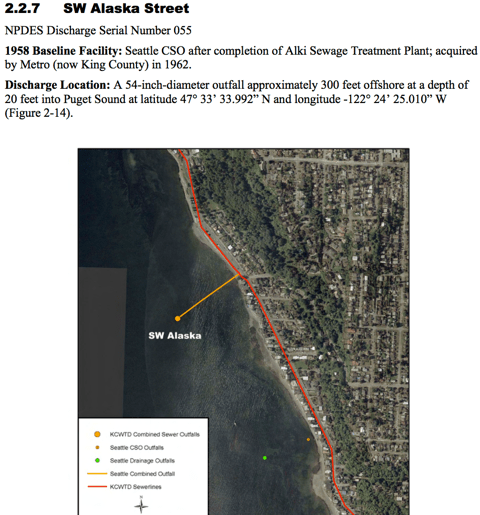 Some new controversy is brewing in regard to the rotten egg-like stench we reported along parts of Beach Drive SW. A neighbor in the 4600 block reportedly complained about the gaseous smell to a King County Wastewater representative and was told that the cause could possibly be related to a recent CSO (combined sewage overflow). At first flush, I would think they are referring to heavy rains we experienced on August 29th which pushed our monthly total far beyond the average. Another concerned neighbor and I caught up with a KC Waste Water truck hanging out this morning at the base of Jacobson Street. The gentleman in the truck explained that he was tasked with installing sophisticated sensors at different points along the sewer line that would indicate any accidental sewage leaks. He went on to say that most complaints of the odor have been located between around LaRustica Restaurant and about the 5000 block of Beach Drive. Also checked out were the City of Seattle lines that run down Jacobson to the main county line. 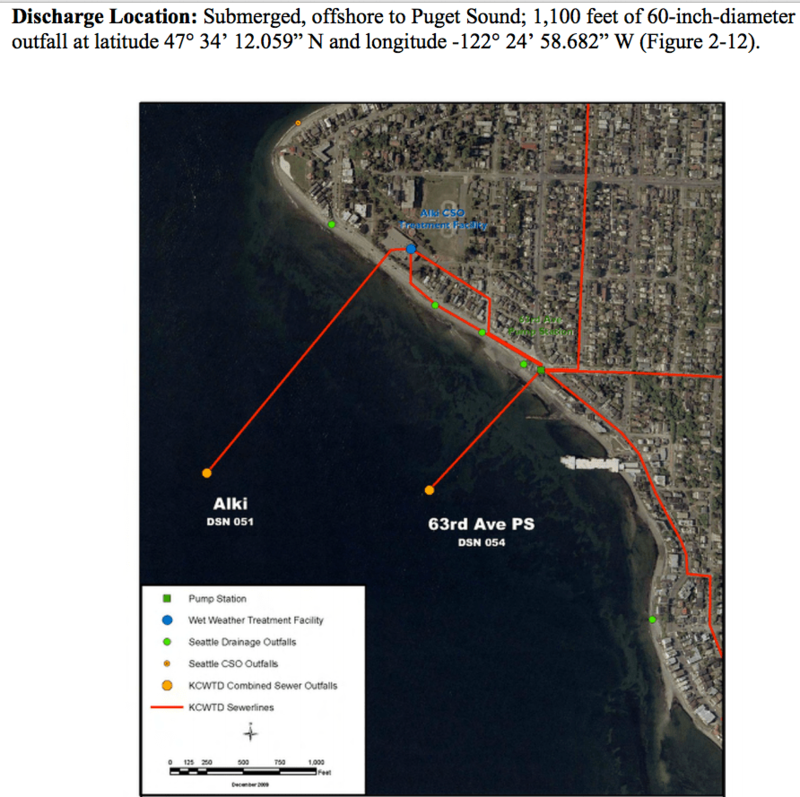 Where the two lines intersect create what’s called the SW Alaska Street Seattle Combined Outfall which dumps out into the sound when the Alki overflow treatment plant becomes overwhelmed. 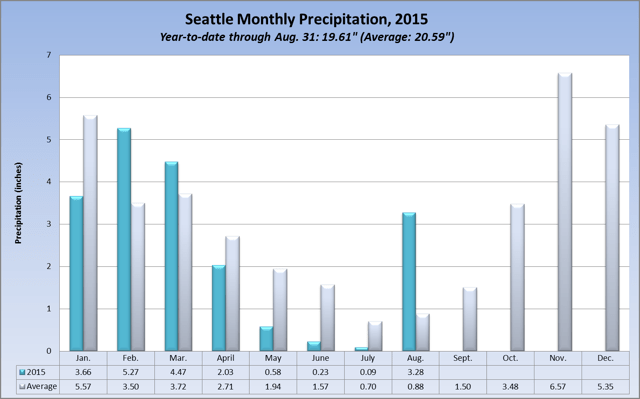 Incidentally, this particular outflow rarely overflows according to report studies (.1% yearly 1987-2007) however it is not uncommon to have some leaky-poos just north at the 63rd St & Alki outflows. The CSO Status website used by recreational divers and beachcombers has been experiencing technical difficulties and is not showing any real time data for the outflow stations in the immediate area. A meeting had been setup between representatives of King County Waste Water Treatment, concerned homeowners and local media for this Friday but has been temporarily postponed. Hi. Thought I would pass along some information about my morning’s experience regarding the odor on Beach Drive. Last night when the odor intensified, I called the hotline you posted on the Blog (thanks for that information). This morning around 11:30 a King County representative came to measure the levels of hydrogen sulfide, the likely gas causing the odor. 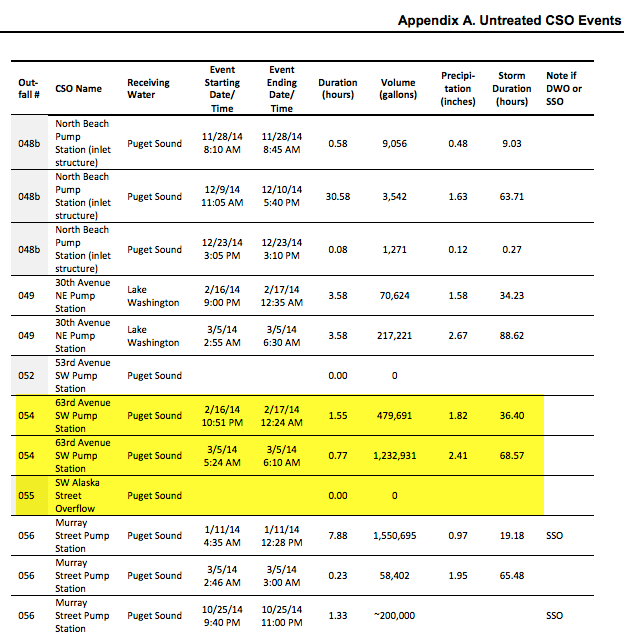 The couple of manholes out in front of the house had a zero reading for hydrogen sulfide. At our deck, water side, the reading was .02. At the bulk head, the reading was .14. The rep said this was definitely abnormal and KC continues to be perplexed as to the cause but is actively investigating. He expected some public announcement next week on the status of the investigation. Thanks again for the information on the Blog. Helps to inform and connect us all. 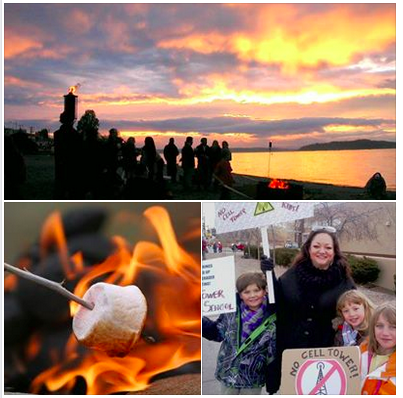 Parents of students a Alki Elementary will join 50 neighbors and community supporters in attending the “Stop Alki Cell Towers” Information Rally and Demonstration on Alki Beach, Thursday, May 7 at 7 p.m. Rally will end with kids throwing 12 cardboard cell tower replicas into a fire pit, as a way of saying they don’t want 12 new cell antenna transmitters to be built so close to their school. 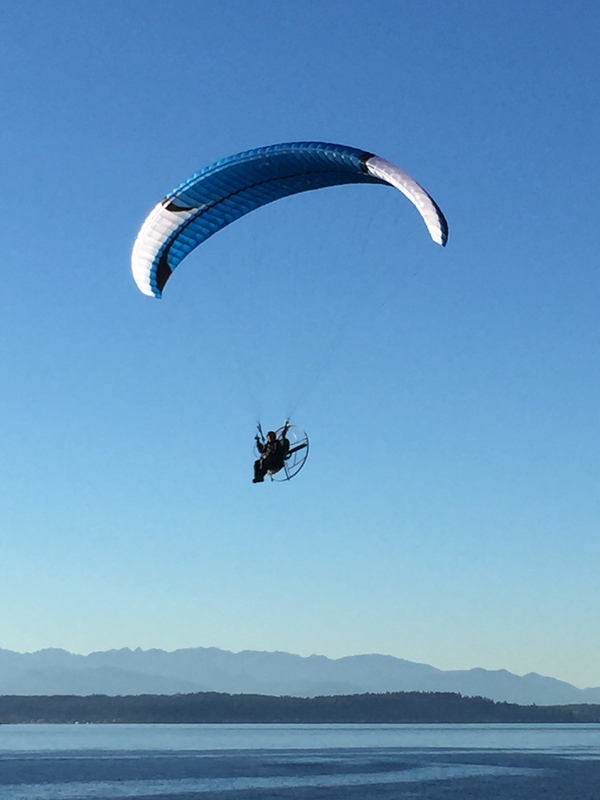 The flight path appeared to be north around Alki Point at around 3:50 PM then back south towards Lincoln Park and beyond! Pretty darn cool if you ask me! These spectacular photos were submitted by Alexa from today. 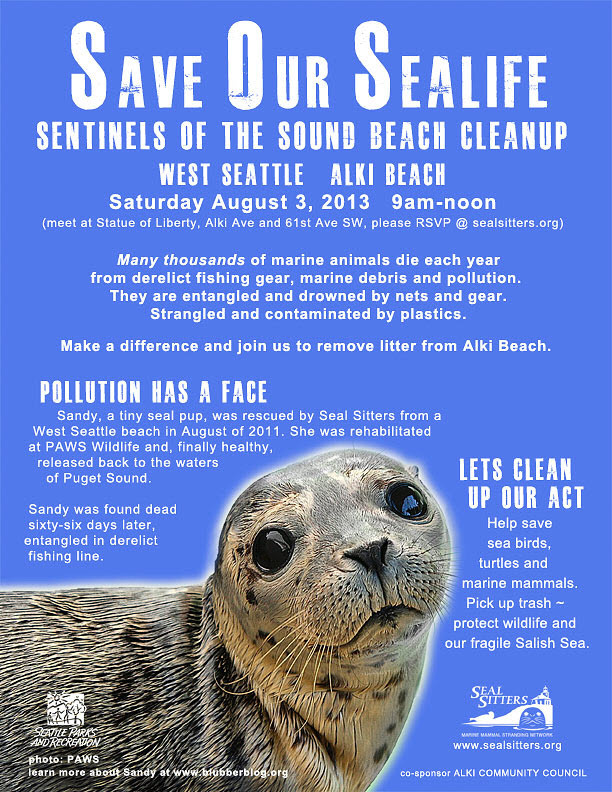 The Alki Community Council is jointly sponsoring the Seal Sitter’s clean up of Alki Beach Park this Saturday from 9:00 am to noon. For more information, or to rsvp for this event, click here.